If you want to keep an eye on your premises from anywhere on your grounds, a wireless driveway alarm system is a great way to do it. Imagine being in your kitchen, your workshop, or anywhere else on your grounds and being able to monitor multiple driveways, walkways, doors and windows simultaneously. If anyone approaches your premises on foot or in a vehicle, you will know immediately. This system also can track outgoing movements—so you will know when the cat has run off and which way it’s gone. Interested in buying a wireless driveway alarm, but not sure what you need? The chart below helps you to quickly compare top products on Amazon.com. 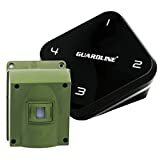 You may still not feel ready to shop for a wireless driveway alarm if you are not all that familiar with the features and options. Read on to learn everything you need to know to buy the best product for your needs. With a wireless driveway alarm, you have a sensor and a receiver. You set up the sensor outside near your driveway, and you set up the receiver in a room in your house where you will be able to see and hear it. If something triggers the driveway sensor, it wirelessly sends a code to the receiver. That code then triggers a pattern of lights and/or beeps (or other audio or visual signals) to let you know which sensor has been triggered. As you might guess, you can link together multiple sensors and receivers. So you can not only monitor your driveway, but also other points of entry around your property. This can be particularly useful if you live on a large estate and need to monitor a number of buildings. You can code different patterns of beeps for each sensor. So if someone approaches the driveway, you might hear two beeps. If they approach the back door, you might hear three, and so on. What type of sensors do you need? Some wireless driveway alarm systems can actually support multiple types of sensors. You may for example be able to incorporate motion sensors, door/window sensors, garage door sensors and water leak sensors all in a single system. Other systems may only support a single type of sensor. Where will you install your sensors? This has an impact on what type of sensor technology you need. For example, some sensors detect motion, while others detect heat. If you are installing your sensor near a tree in a windy location, you might get a lot of false alarms from the branches waving around if you rely on motion sensing technology. A passive infrared (PIR) sensor may give you fewer false positives. 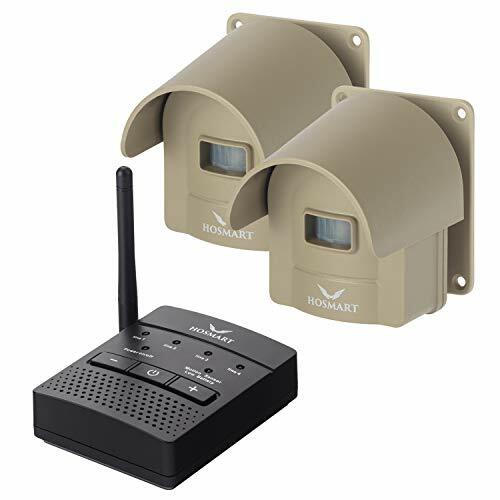 Many wireless driveway alarm systems can be expanded to integrate a number of sensors and receivers. Before you purchase a system, check to see how many of each type of unit you are allowed to add. Also check to see the options for linking them up. Can you link multiple sensors up to a single receiver? What about multiple receivers to a single sensor? What types of batteries do you need to power the sensors and the receivers? Can you use rechargeable batteries or only single-use batteries? How long can you expect them to last on a charge? You can also check to see if any of the sensors offer alternative power options like solar. Weatherproofing is going to be an incredibly important feature in most climates since your sensors are going to be located outdoors. They will be subjected to wind, dust, rain, and snow, not to mention extreme temperature swings up and down. There may also be situations where you want to keep a receiver outdoors, so check for weatherproofing on these units as well if that is the case. You may not always want to have your wireless driveway alarm beeping. If for example you are going to be working in your driveway shoveling snow, the last thing you need is to have the alarm beeping constantly at everyone else in your household. This is why you should look for different audio modes like alert, alarm, and mute. Previously we discussed how driveway alarm systems may produce different beeps or flashing indicators to tell you which sensor was triggered. Another common feature is a set of zones. Each zone corresponds with an LED on the receiver. If a sensor for that zone is triggered, that particular LED will flash. If you have a system which does not include a status check feature, it may be impossible to know whether your connection is still working or whether the signal has been lost. Someone could breach your security while this is going on. You also will not know when your batteries are running low. With status check feature, you will be able to see how much juice your batteries have. You also will be able to monitor the health of the connection between the sensor and receiver. That way if the signal is lost, you can do something about it instead of waiting and wondering. Depending on how large your property is, you may need a long range for your connection. Figure out where you will set up sensors and receivers, and then actually measure the longest distance to figure out how many yards you need. Many systems can accommodate up to half a mile. You now know what you need to in order to shop for the best wireless driveway alarm. Think about the size of your property, the range you will need, how many zones you will have to set up, and what types of sensors would be best. Then scroll back up to the top of this page to view our product comparison chart. 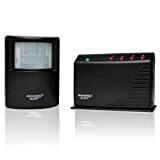 There you can view features and prices for highly-rated, top-selling wireless driveway alarm systems on Amazon.com. Looking for more versatility and adaptability from your wireless driveway alarm system? 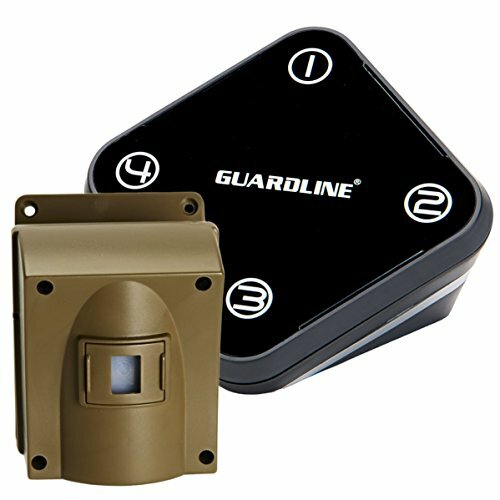 Then take a look at the Guardline GL5000. This system can be augmented with extra sensors and receivers so that you can expand the range of your motion-sensing and keep track of what is going on around your property from any room in your house. Fast and easy to install. You can probably get set up in around 30-45 minutes with this system. Loud chimes. You should have no problem hearing the chime if motion is detected. If it is too loud, you can also adjust the volume down. 30 different ring tones are included, so you can pick one that you like. Scalable system. If you have a large area you want to monitor, you can connect more sensors to the system. You also can augment it with additional receivers. That way you can hear the chimes from anywhere in your residence. Great for any climate. This monitor can perform in temperatures as high as 140 degrees Fahrenheit, or in environments where the cold ranges as low as 4 degrees below zero. Basic weatherproofing protects the device from precipitation, and there is also a hood to offer additional shielding. Backed by a two-year warranty. If your alarm is damaged in any way, a two-year warranty protects your purchase. There may be false positives. This seems to result from wind sometimes. This is common with these types of devices. Try to place yours in a sheltered location. Do you wish you could get more range from your driveway alarm system? You may want to take a look at the Hosmart DT-45538. This alarm offers reliable long-range reception, and comes with plenty of other great features and advantages. Outstanding range. On a property which is relatively free of obstructions, it is possible to get up to around half a mile of range with this system. That is quite good compared to a lot of competing products on the market. The system is pretty good at penetrating through obstructions, but keep in mind that they do significantly hamper the range. Scale up your system as needed. You can literally hook an unlimited number of sensors and receivers together with this system. Fast installation. It is simple to get set up, and it should not take you more than a few minutes before the system is up and running. The system comes with an instruction manual which is clear and easy to follow. Sturdy build. The alarm unit is manufactured out of tough PVC. The seal is rubberized in order to keep out precipitation. Good customer service. If you have any questions or concerns about the alarm system, the support staff is friendly and knowledgeable. There are some issues involving batteries. Some units seem to have shipped out with defects. The batteries run out too quickly for the alarms to be of use. On units which are unaffected by this issue, however, the batteries can last for around a year. Looking for a driveway alarm system which will help you save money? One excellent budget option is the 1byone O00QH-0514. 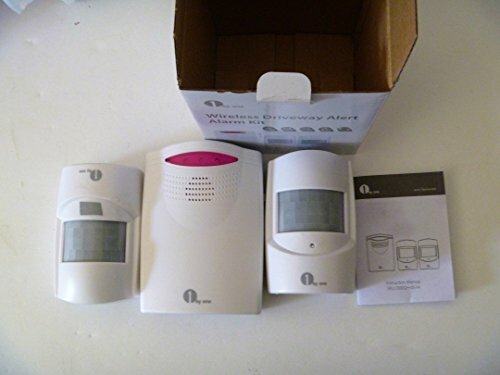 This alarm is easy to set up and use and provides great range and features at a low price point. Expand the system if you need to. 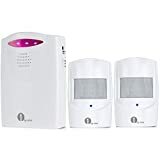 To monitor a large area or to receive alerts in more than one area of the house, you can connect additional alarms and receivers are needed. Alerts can be customized. There are three modes available, so you can either select a sound and LED light, a sound and flashing, or simply a silent flash alert. You also can adjust the volume up to 100dB. Multiple power options. You can either plug in and use AC power, or you can rely on the 1.5V type C batteries. Works in harsh climates. Whether temperatures plunge down to -4 degrees Fahrenheit or climb to 120 degrees Fahrenheit, this system will continue to function as expected. Ample range. In ideal conditions, you can get up to 328 feet of range with this alarm system. If there are obstructions in your driveway or yard, that could reduce the effective range. Sometimes these alarms are a bit finicky. They may not go off when they should, or may give false positives when nothing is going on. The latter is quite a common issue with driveway alarms, which may react to wind. Direct sunlight may also set off the alarm. If you’re thinking about getting a driveway alarm but you don’t want one that will break as soon as you install it, check out the GL2000 from Guardline. The GL2000 is the only driveway sensor we know of that comes with a lifetime warranty. The company is so confident that in their sensor that they’ll replace it for free if it stops working. Lifetime warranty. If it breaks, just send back the GL2000 and Guardline will send you a new one. Customizable. Quickly set up unique security zones that have different sensitivity settings. Choose batteries or AC power. Batteries last forever in this device, but if you don’t want to worry about replacing them periodically just switch to AC power instead. Catches lurkers. Stop shady individuals from sneaking around your property. Loud volume. Choose from 32 different alarm sounds. Comes with tools. This alarm comes with a screwdriver & mounting kit. Rugged construction. The GL2000 is built to resist rain, wind and snow. If you want to hide the GL2000, you’ll have to cover up the LED with a piece of tape. The red indicator light gives the sensor away. How is range between the receiver and detector affected by the receiver being located in a metal building? The range should be fine inside a metal building. I’ve looked through comments on product pages and have yet to see a reviewer mentioning an issue from within a metal building. I’ve even seen some reviewers commenting that they specifically tested for use in a metal building and everything worked out great.